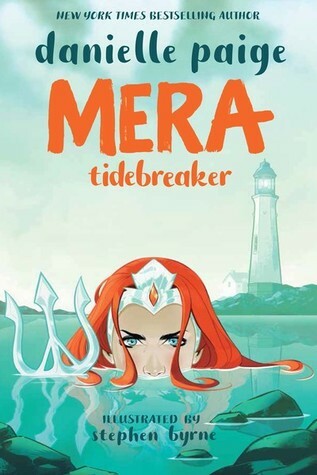 Princess Mera is heir to the throne of Xebel, a penal colony ruled by Atlantis. The Xebellian Court is expecting her to marry and bring a new king in, and their military is plotting to overthrow Atlantis. Mera plans to seize control over her own destiny rather than follow through with her father's expectations by assassinating Arthur Curry, the heir to the Atlantean throne. However, the two fall in love, complicating her plans to free her people. The art in this comic is done by Stephen Byrne, and it's all clean lines and blues (except for Mera's bright red hair) while in Xebel. Even up on land, there is a muted state to the colors, almost as if it was done with watercolor. That brings the feeling of the sea even to the land-based scenes, in keeping with the sea theme for the story. The drawings of the action and fights really convey the tension from the very beginning of the story. While Mera tries to fight and generate a little anarchy to upset the Atlantean warriors that patrol the Xebellian territory. Mera is a teenage rebel, after all, and she values those actions more than dressing up and looking pretty to simper in front of Atlantean dignitaries. This is why she takes it upon herself to go to the surface world to find Arthur Curry, and intends to kill him to ensure that she would rule on her own. Because she doesn't know how to use her abilities on land for the first time, this means she's physically weak and taken in by Arthur to heal. Of course, she learns about him while hiding her purpose, and discovers that Arthur doesn't know about his Atlantean heritage and is a genuinely good man. We learn the truth of him and the history of their people as she does, and she does have difficult decisions to make. Overall, this is a great story focusing on Mera and Arthur, involving hard choices and delving into the nature of honor when different kingdoms at war are involved. Have you entered our current giveaway sponsored by #JORDWatch?